September is known for a few things … the end of summer, back to school and of course, the new iPhone. Yes, it was that time of the year again when we turned our attention to Apple’s new offering, the iPhone 6s and 6s Plus and how we could promote the all-important fact that O2 is a stockist with a brand new tariff. So, the moment Apple announced the new device, we were hot on its tails ensuring that every tech writer across the board knew that O2 would be a stockist. Then, as the world was waiting for pricing details to be released, we filled the gap and announced the all new Refresh tariff which allows users to trade in an old iPhone for new with every new launch and receive free insurance – gaining coverage in the likes of FT, City AM. Announcing pricing then gained hits sweeping the nationals across The Daily Star, Daily Mirror, The Independent, The Daily Express and the Daily Telegraph. But, it wouldn’t be an iPhone launch without O2 doing something a little bigger to mark the occasion. 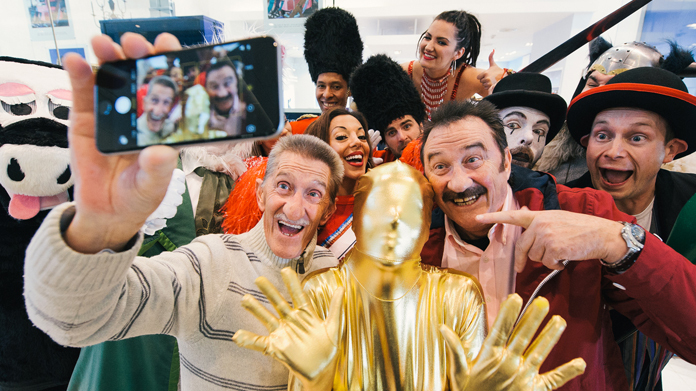 So on the morning the device officially went on sale, we created a photo moment in the form of our ‘Peculiar Queue’ – fronted by none other than childhood favourites, The Chuckle Brothers. Our line-up of curious characters took their place in our queue outside the O2 store in Westfield, so O2 customers didn’t have to – pulling in coverage across The MailOnline, half a page picture in The Times, Metro and Mashable UK.